A new report gives us a clear idea of how Audi's EV onslaught will pan out over the next few years. We know that Audi is planning an EV onslaught, as the automaker has confirmed it will launch 12 electric vehicles by 2025. According to Automobile Magazine, we can expect to see electric e-tron versions of almost every single model in the Audi family. 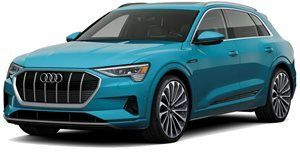 In addition to the e-tron SUV, Audi is also launching the e-tron Sportback and the production version of the luxurious e-tron GT that will compete against the Tesla Model S. In late 2020, these models will allegedly be joined by a small Q3 e-tron, based on the Volkswagen Group’s MEB architecture. In 2021, Audi’s EV onslaught won’t show any signs of slowing down. According to the report, there will be an e-tron GT shooting brake in the same vein as the Porsche Taycan Sport Turismo, as well as a Q2 e-tron and a Q4 e-tron, which was recently previewed as a concept at the 2019 Geneva Motor Show. The following year, an Audi Q5 e-tron will allegedly arrive in dealerships. Then in 2023, the production version of the driver-focused PB18 hypercar concept will launch. Other models reportedly launching in 2023 include a Q6 e-tron, Q7 e-tron, and a flagship Q9 e-tron that will likely be similar in size to the current Audi Q8. After these models launch, Audi will then release an A4 e-tron to rival the Tesla Model 3, an A6 e-tron, and an A8 e-tron. These models will allegedly be available either as a sedan or wagon. If the report is accurate, this gives us a clear idea of how Audi's war against Tesla will pan out in the next few years, but keep in mind that a lot of these models haven't been confirmed by Audi yet. Audi has also recently said it is considering making electric versions of the TT and R8 as the combustion-powered versions may not be renewed after the current generation.